So, last week I was in New Orleans busy with my robotics team- we got knocked out in the semi-finals on the 3rd out of 3 matches; by 8 points. I sincerely apologize, but this is the reason there weren’t any articles later last week. I have just returned home, and will be around all of this week. Sidney and I didn’t get to record a podcast because both Monday and Tuesday we were busy separately with our own things. In Apple news last week, the 2nd generation iPhone rumors began to heat up, which we will only see more of in the coming weeks. Otherwise, fairly quiet on the Apple news. Have a great Monday! I am competing in New Orleans today, so my regular article will be a little late today. Sorry for the delay, I’ll see you guys later! Safari 3.1: More Than Just a Number! Apple released Safari 3.1 this past Tuesday, among speed increases and support for HTML5 and CSS2, Apple included a few more enhancements not known to all. 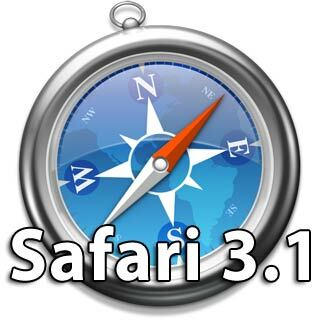 Safari 3.1 was released on Tuesday via Software Update to both Mac and PC’s. Today, I’m going to be giving a couple small hints regarding Safari 3.1. If you have already software updated to get it, good for you! Otherwise, I recommend you do a Software Update, or check out Apple’s website for the installer. One of the most interesting, and certainly attractive features of 3.1 is the Element Inspector. Meant for developers, you can select individual items and see its place in the code. This can particularly useful when debugging a website across multiple browsers or looking at why something doesn’t appear correctly. There is also a host of tools that allow you to see how large your website is to load, how long it took your computer to load scripts, images and more! Not only does Safari 3.1 improve upon the already rich experience in Safari, it takes the Safari for Windows out of beta! In version 3.1, Safari on Windows has transformed into a very rich browsing experience- and this isn’t just Apple speaking. Over the course of the past few days, I have read numerous reports about Safari’s growing strength on Windows- how it has become a real contender to Firefox and Opera. You might have also heard about the recent controversy surrounding Apple Software Update for Windows. 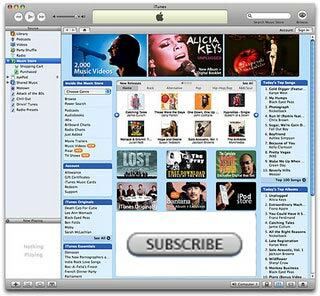 Basically, Apple is pushing Safari 3.1 upon anyone who has Apple Software Update installed- making it appear as an update to QuickTime or iTunes would. While I think the concept of spreading Safari for Windows is good, I feel that Apple should have only suggested users download Safari. Either way, Apple is seriously preparing to increase competition in the Windows and Mac browser market. 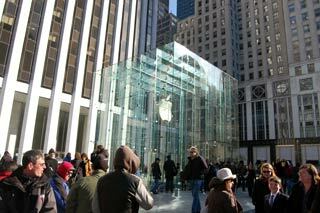 Over this past weekend, a friend and I decided to take a trip to the 5th Avenue Apple Store. The experience below. Outside the 5th Avenue Apple Store, Jobs’ 32 foot cube in sight. My friends and family know that I often like to take trips to the Apple Store for no apparent reason. About every month or so, I’ll make at least one trip to my local Apple Store- there are quite a few, actually! Because I live in New Jersey, 10 miles from New York City, I have access to 3 flagship stores and 3 regular Apple Stores within a 15 mile radius!! After the opening of the West 14th Street store (which you can see here), I was instantly in love with the 3 stories of Cupertino goodness found on 14th Street- which still holds the crown as my favorite Apple Store ever. However because it was Easter Sunday and all other stores in the area were closed, my friend and I went to the 5th Avenue store, which is open 24/365. Upon our arrival we found the store to be quite crowded, probably due to the Easter Parade which takes place on 5th Avenue, not to mention it was one of the few businesses operating that day. Inside the store, it was nicely crowded, you had to wait to do anything, not to mention the line coming in and out of the store. As usual, most people were just surfing the internet and playing on iPhones and iPods- I saw relatively little retail activity- even though there was a large line to the registers! We started by playing on iPhones (which I’ll get into at a later date), and then wondered over to the MacBook Air table, which we spent a lot of time at. We were on one for maybe 20 minutes, when all the sudden someone took control of our mouse and promptly shut down the computer- via Remote Desktop, of course. Puzzled we turned the computer back on and quickly slid down one MacBook Air and resumed our browsing. 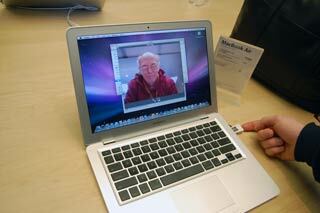 Exploring the contents of an Apple Store MacBook Air. Later, we moved over to an iMac, where I was showing my friend something by Control+Scrolling (via Mighty Mouse) and found myself stuck zoomed in to a portion of the screen. Maybe you guessed it, but the down scrolling wasn’t working! I ended up navigating into System Preferences and turning off and on the Control Zoom feature to bring the display back to normal. Dammed Mighty Mice!! While an easy fix for my mice at home, I was disappointed that at the Apple Store it wasn’t taken care of. Then later, it happened again! Before leaving, I wanted to play with Aperture 2 on a new computer (ie, not a PowerPC based computer), so we found an empty iMac in the opposite corner of the store to play with it on. Not remembering my previous experience with the Control Zoom, I did it again, showing a section of the new Aperture UI. This time a little more frustrated, as it is something that I use often, I realized that this Mighty Mouse didn’t scroll down either! Gah! How are people new to the Mac platform supposed to scroll down? Or see Apple’s hardware not working?! I am currently drafting a formal complaint for the store. Otherwise, it was a typical Apple Retail experience, good, clean, pleasurable. I hope next time I go to use a Mighty Mouse it can scroll both ways. If not, I’ll have a nice template to send my complaint with. Last week was great- we saw a nice increase of traffic, a new podcast (finally) and began our affiliate program. This week ahead is going to be very interesting. I am leaving for New Orleans on Wednesday morning, and will not return until mid-day on Sunday. This may mean that I will not produce an article every day, but rest assured that I will do my best to get content out everyday. Sidney and I are going to record an audio podcast either today or tomorrow, as we are trying to increase the consistency of podcasts every week. It has been a relatively quiet week for Apple news, and probably will be similar this week. But who knows? Happy Monday y’all! If you would like to subscribe to this podcast in iTunes, simply click on this link(iTunes Store)! MacBook Air: A Laptop for the Others? The MacBook Air is Apple’s smallest laptop ever- but where does it lie with other laptops? Is there something hidden under the MacBook Air? When Steve Jobs released the MacBook Air, the intention was to fill a gap in the existing Apple laptop lineup. Following the buzz of Macworld, many reviewers have ripped apart (literally) the MacBook Air and comparing it to the other ‘Ultra-Portable’ computers from other manufactures. From the non user-replaceable battery, to no Ethernet jack and only one USB port- people have poked at some of the cons of using the Air and since given it mixed reviews. While the complaints are genuine, now more than 2 months since the release of the MacBook Air, I have found most of the reviewers are slightly biased. As the reviews came out I would always find myself saying- “Well, this is what someone tech savvy might say, but what about the others?”. The answer is usually: “they don’t really care”. Most people don’t care about taking advantage of all the features in their computers- both hardware and software. They just want to do whatever they want to do. Those who take full advantage are usually the more technically inclined- ie, the people writing the review! While I am not refuting the claims made by reviewers of the MacBook Air, I feel that most people who are interested or buy the MacBook Air don’t really mind the tradeoffs associated with it. And while you can say that with virtually any product ever, the MacBook Air appears to be in strong demand. I think that the MacBook Air might prove to be a very successful laptop, but certainly never overthrow its big brother, the MacBook Pro. Currently residing on the number one spot on the Apple Online Store, seventh on Amazon Notebook section (joined with five other Apple laptops), one can assume it is selling with reasonable pace. Apple even keeps a MacBook Air availability badge for each one of it’s retail stores, updated daily at 9pm, much like the iPhone badge seen in June of last year. The MacBook Air availability checker. So what is my point? 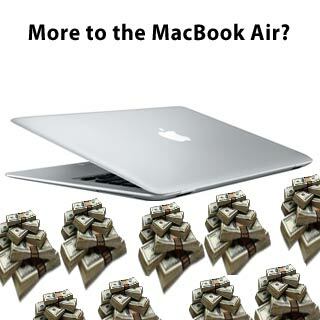 The MacBook Air appeals to a certain type market of people. While this may not be everyone, it appears that a substantial amount of people are buying it. They feel that the other benefits the Air offers outweighs the non-user replaceable battery, one USB port or lack of Ethernet jack. While no product can ever be perfect, we shouldn’t forget that everyone sees things differently. This holds true not only with Apple, but the entire tech industry. Starting a series of reviews, we will be looking at valuable pieces of software. Today’s review is about WhatSize. I am often asked by people looking to clear out space on their Mac for the best strategies and techniques to free up those precious bytes. The answer I always give is to download WhatSize. WhatSize is a great utility for mapping out the depths of your hard drive and quickly finding large files. Often when tight on space, you want to files that are taking up the most room and decide what to do with them- in a timely manner. Without WhatSize, it can be a taunting task of cleaning up a cluttered harddrive through just the Finder and the Get Info pane. This is why WhatSize can prove valuable to make it easy to find these large files. When you run WhatSize, you see a tree of drives and folders in your home folder. Simply select one of these drives or folders, and it will start mapping out the selected destination. Once WhatSize is done, you can explore the contents of the selected destination. WhatSize will color code the files by size- those that are over one gigabyte, red, greater than one megabyte, blue and files that are greater than one byte green. You can then easily send items to the trash or open them in a Finder window all within the WhatSize browser. Earning 4/5 i’s for our first Application review, you can download a copy and try it out on your own. More about the developer, id-design inc here. Sorting files by size, color coated. 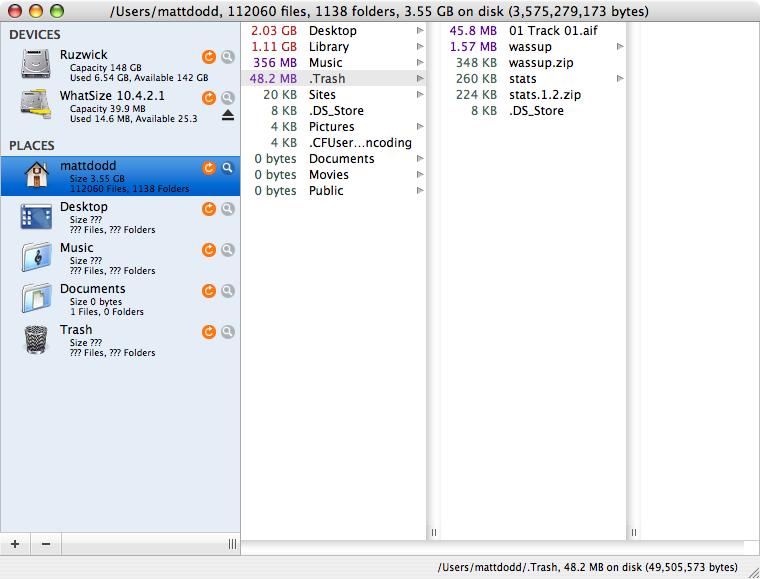 WhatSize offers a nice user interface for finding large files, and at $12.99 is worth your money. This commercial is the most recent Apple commercial. Playing on many primetime spots, it shows the various functions of the iPod touch. It has also been added to The Daily iLife podcast today, which you can subscribe to in iTunes or watch here. 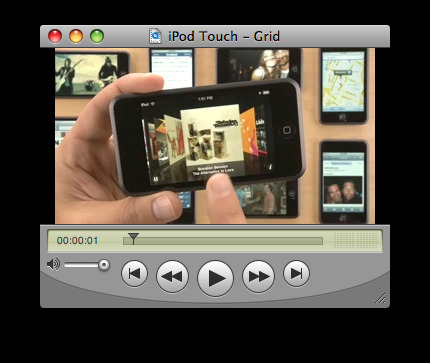 The second iPod Touch commercial touting its various features from web browsing to music.